A few months ago I was commissioned by David & Angela Clarke, landowners at Uisneach to create an interpretative illustration of the important assembly site at the hill of Uisneach in Co. Westmeath.The archaeological direction was provided by Dr.Roseanne Schot & Uisneach tour guide Justin Moffatt. 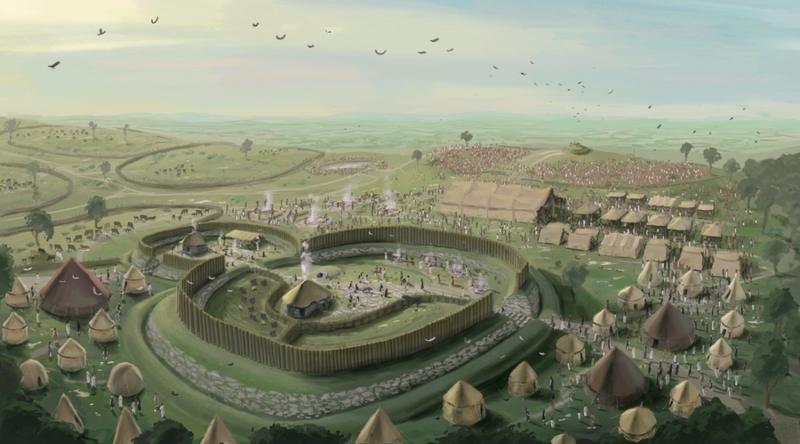 The illustration shows the Mórdáil Uisneach or great assembly at Uisneach during the early medieval period, The hill of Uisneach was known in the early middle ages as the navel of Ireland as it was believed to have been in the centre of the island. In the foreground you can see the figure 8 double embanked early medieval Rathnew Ringfort. On the rise beyond you can make out the mound of Carn Lúdach, from the bronze age and in the dip between it and the next slope you can make out Lough Lugh, named after the famous god Lugh in Celtic/Irish Mythology, whom the city Lyons in modern day France receives its name from. As mentioned the ringfort is called Rathnew, it was a Figure of 8 ringfort, 90 m diameter, 2 banks with 1 ditch between, the Banks were revetted with the outer bank 0.8m high with the inner bank 1.7m high. Inside were 2 houses; the so-called Eastern House and the Western House, both of which were probably thatched. 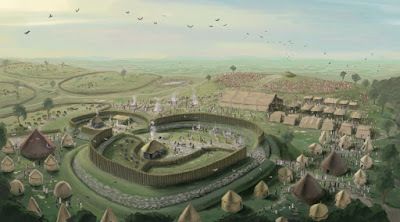 The south entrance to the ringfort was causewayed across the fosse, with stone revetment and metalled surface, flanked on either side by a row of stones, 0.3m in height. And in the larger ring of the figure 8, you can make out the remains of a circular enclosure from the Iron age, at the time shown it would have just been a slight line, as shown. There is also a souterrain which were used for storage of foods and the like during the early middle ages. A souterrain is a cave like artificial structure, which are often quite cool, so you can imagine, good fridges. There is also pens for some pigs and the prize bull of the lord inside the ringfort proper. Are prints of this beautiful image available? Hey, thanks for your interest! Im afraid I dont but I believe the people at Uisneach are selling cards of it, you want to give me your email and I can see if I can put you through to them? Sadly, I really had my heart set on a larger print. It's an amazing piece, and I just adore it! You are very kind thank you! Well in that case, if you want to give me your email address, ill keep it for when I do prints. Im afraid Im a little on the busy side at the moment but in the next few months I may get time, and I can email you when I break off some time to do so.